Through a small compilation of a few oil paintings, one can create far more than Art. The art world, and what each picture represents, is far beyond the image, color, perceptions, feelings and sensations. The art and its content give value to the painting, transmit us knowledge and reveal a message of deepness. Thus, each painting itself is unique and each one is associated to a person, and therefore it is given a name, as a tribute to unique personalities that quickly distinguished themselves in history. Men and women from the past that stood out for their ideas, for their special work or discovery, and how they have been perpetuated through time as an icon to inspired future generations. Thus we have, for example, the painting: 'Many Worlds' of Everett, 'Portals' of Einstein, 'Golden Spiral' of Leonardo da Vinci, and also, for example, 'The Guardians' of Euler. In a simplified way, but not less interesting, each painting represents itself a name, a thematic and therefore a story. A work that let us know some of the most important thinkers of our history, focusing primarily in the area of Art & Science. A short passage, with a clear and concise presentation of their most fundamental ideas, or a brief reference to their lives and their discoveries. Scientists, artists, writers, quickly classified as genius. Unforgettable names, unquestionably, but it is never too much to remember them again: Galileo, Einstein, Newton, Euler, Van Gogh, Leonardo da Vinci, Klimt, Faraday, Clausius, Marie Curie, etc. Between the artist who wants to create something that does not exist; the scientist who wants to know deeply about everything that exists; it stands out the poet who aspires to the ability of simultaneously embrace all that exists and also what it does not exist, being the only one to be able to see and visualize as easily both the Real and Imaginary worlds. 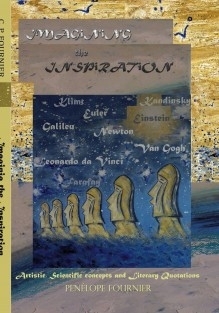 Finally, the portfolio of 'Imagining the Inspiration " includes a diversified and interdisciplinary universe, consisting of a compilation that brings together three distinct concepts and dimensions: a Gallery involved in an Artistic concept, Scientific concepts, and Literary quotations. Under this perspective, the texts, images, and quotes included, have no other ambition than making themselves available to readers as a Manual of Inspiration.